There is a small parking lot, as well as street parking and a public parking lot near the library. Our tea room is open for private showers and parties on Sundays and after 4pm on Saturdays. 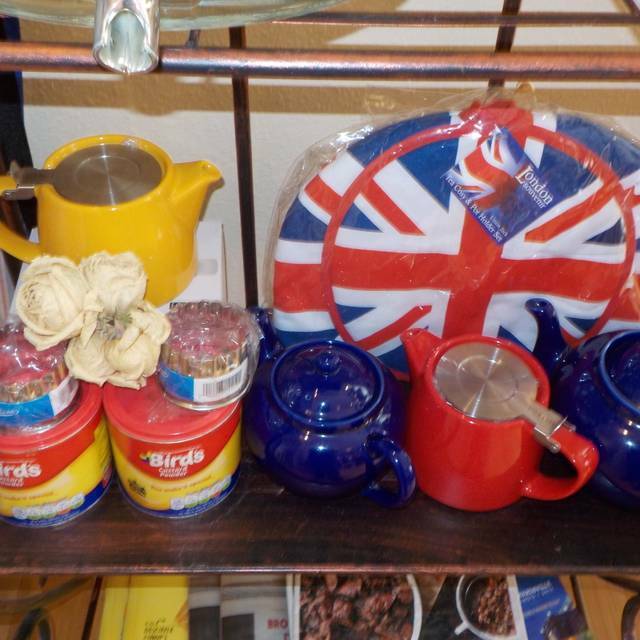 We are thrilled to provide you with the opportunity to experience British fare right here in Edwardsville, Illinois. At our tea room we offer lunches, beverages, cakes and pastries Tuesday through Saturday from 11am till last orders at 2 pm. The menu comprises of regular tea room fare with a sprinkling of British favorites. We serve Traditional English Afternoon Teas on Friday and Saturday afternoons and on the second Sunday of every month. 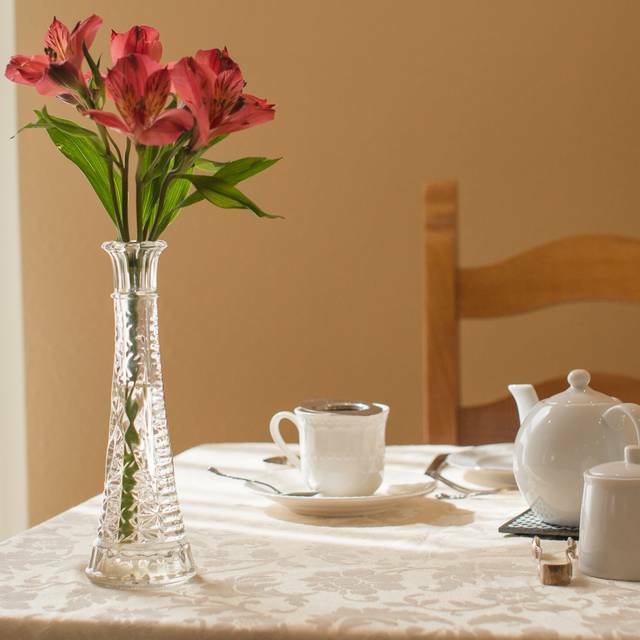 Our menu of freshly prepared finger sandwiches, homemade scones and clotted cream followed by a selection of three delicious dessert items are accompanied by quality loose leaf tea, served in teapots and brewed to perfection. Please state any dietary requirements you may have when placing your reservation (Gluten free, vegan etc). The service and the food were especially good. Sandwiches were fresh, all foods were tasty, desserts were delicious. The food servings were generous. We took some home and the lady packed it nicely in boxes for us. The afternoon tea was a delightful experience. I would recommend this tea room and its service to anyone who wants a special experience in dining. I love the comfortable and relaxed feeling of this place. We have been coming for the Afternoon Tea for a number of years. The tea selection is awesome so you can be as adventurous as you want. The food is excellent - the scones are the best anywhere. Service is always good and you can buy scones or loose teas to take home. The food was delicious. There were so many other items on the menu I did not try, I will have to go back and try those too. My fiance and I went to The Queens Cuisine for a late valentine's day afternoon tea. It was everything we could have hoped for and more! First of all, the ambiance. Finding parking was rather easy, there's a dedicated lot behind them. Once you walk in, the tea room is so beautifully light and airy- while still feeling cozy. The warm, light colored floor reflected the light of the many windows perfectly. The decor was a good mix of entertaining while not feeling cluttered or too generic. It has so much personality! The table was set for us, and we were sat down right away, with a huge list of teas to choose from. We are quite the tea obsessed couple, and we had more than enough options to keep us busy (of many varieties of tea to boot). The food was absolutely sublime. The vol-au-vents were perfectly made- crisp and buttery on the outside, and the filling was subtle and creamy, the sandwiches simple and satisfying, the pastries without fault- very yummy! (especially the bread pudding- the orange liqueur flavour was an unexpected delight) , but the real starts of the show for us were the apricot vanilla scones with clotted cream. They were absolutely out of this world! We loved them so much- we took some more home with us, along with clotted cream, and a tea. We also took home a cornish pasty- and it was so incredibly scrumptious! The pastry was delicious and crumbly, and the meat filling was perfectly spiced. I want to once reiterate how amazing the service was. Very personalized, and everything we could have wanted was seen to. both of the ladies that helped us (one was the owner I believe) were beyond wonderful. We will definitely be coming back- many times over, for more delicious food, and wonderful cozy service. We absolutely love this place. So yummy and fresh. The chicken salad is the best and the variety of tea is awesome. ‘‘A charming spot. It’s like dining in a quaint English country cottage. The food is authentic and the hostess is as well. The teas and scones are wonderful. A very comfortable atmosphere. We will be back. I heard good things about Queen's Cuisine from a friend and it lived up to its reputation. There were three of us in our party and we all chose the sampler plate. 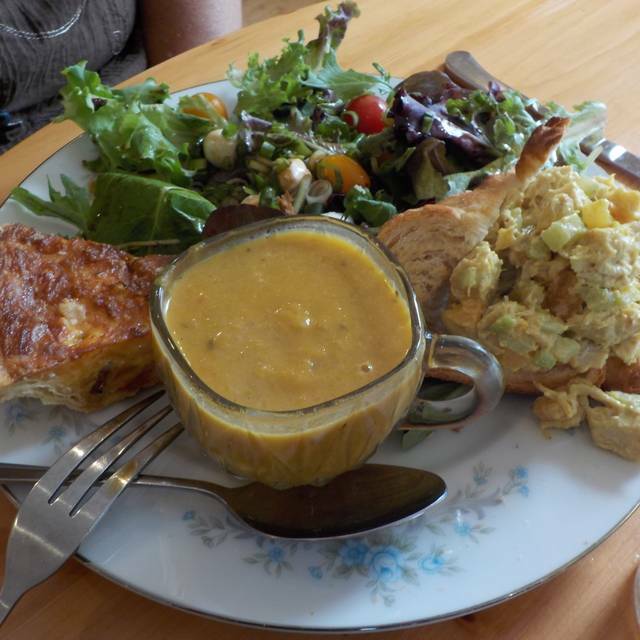 The quiche, tomato soup and salad were our favorites. The croissant was delicious, but the chicken salad was everyone's least favorite. I personally appreciate hot food and was happy to know that the quiche was fresh out of the oven. The sparkling raspberry iced tea was a treat, too. Even though it's not a short trip from St. Louis for lunch, we all agreed that we will go again. First of all, I love to have High Tea. I've had it both here and in London and I am very glad there is a restaurant here that has true English food. The atmosphere is welcoming and tastefully decorated. The service is always friendly and efficient. I bring friends and reserve it as my "special" place. I've been going to Queen's Cuisine since it opened, and following Chef Jane even longer. It's always a great experience. The food is exceptional and the experience is top notch. My wife and I enjoyed our sandwiches and sides (especially the fruit cup). The tea selection was extensive; I chose the Naughty Vicar (for the name) and was not disappointed. We also learned of some places in Britain to visit when we travel there in a few years, and our host suggested some new British dramatic series to try. We have enjoyed Doc Martin, Poldark, and Call the Midwife in the past. Queen's Cuisine is a small, comfortable, British-themed diner. The gracious British owner encouraged us to look around at the decorative pictures, etc. Queen's has a great variety of menu items including numerous teas. Their prices are a bit higher than fast food restaurants, but the ambiance and food quality are worth it and I accept and enjoy it on special occasions. Had a lovely lunch with a friend I had not seen in awhile. Slow pace, relaxed , and delicious. Always a treat. My daughter and I had tea while visiting the Queen's Cuisine. All of the offerings on the tea service were delicious! We really enjoyed ourselves. I have also been there a few times for lunch and that is very enjoyable as well. I always leave with a bag of scones because Queen's Cuisine has the best scones around! 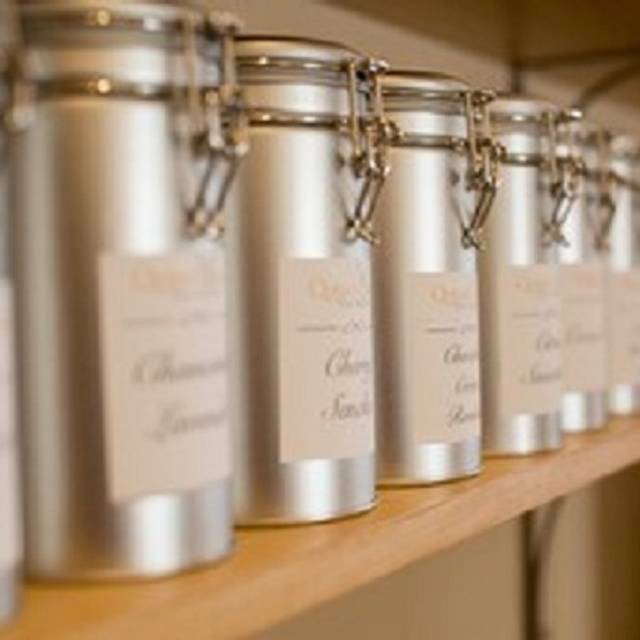 Queen's Cuisine is a comfortable, relaxed tea room with a fine variety of teas and a full complement of delicious traditional teatime and luncheon foods. The atmosphere is refined, but not at all fussy. It's a pleasant place any day. Love coming here for delicious British food, whether for lunch or Tea. Wonderful lavender coconut scones! We went for the first time and really loved it! The food was special and delicious! Service was warm, friendly and efficient. Would definitely go back and would recommend! Wonderful British atmosphere and superb food. Love the regular meals and the special afternoon tea. The food for the Mother’s Day tea was perfect, from the tiny sandwiches to the delectable meringue with homemade cherry preserves inside it. Yummy! Lovely! We were well taken care of but also experienced a leisurely tea. Queen's Cuisine is an excellent Tearoom dining that is quiet and elegant. Very enjoyable! Good food and a very nice atmosphere. Plan to return soon. St. Louis. Just a pleasant afternoon. We took home Scones which were delicious. Also had fun exploring some cute shops. The reservation I made was for afternoon tea. When I arrived the owner said that was not possible. Big bummer. The salad was wonderful. But, the pastry of the Cornish pasty was burnt. I wanted to like it but, the crust was a disappointment. Then, my Holiday scone (apparently, the last one), was given to another customer. They gave me a golden raisin scone- good, but no holiday scone. I will go again, because the potential is there and I want to try afternoon tea. My mom and I had afternoon tea for her birthday. We spent 2 hrs happily munching delicious treats and talking. It was a wonderful afternoon. The staff was friendly and we loved the space. A very nice place for quiet conversation. You’re never rushed and the service is impeccable. Small menu but with several options that make for a nice lunch. Visited for lunch during the week. Food and tea were really good! However, definitely not for anyone looking for a quick lunch. My group of 4 ordered soup, salad, sandwiches and it took 50 minutes to get our order. It also took 30 minutes for us to just get our tea. Would recommend if you are looking for a leisurely meal. My sister and I had a wonderful lunch here. The tea and food was very good and very quaint cozy place. My friend and I had a lovely, rush-free lunch with luscious tea, quiche, and salad. My friends and I had a wonderful time at Afternoon Tea! The food was awesome and the restaurant was very authentic. Would love to come back with my girlfriends again. Was very impressed that they were able to accommodate one of my friends' gluten intolerance when I gave them advance notice of the issue. Would recommend! We recently tried Queen's Cuisine for the first time, based upon a newspaper article I had read, supplemented by online reviews. It is in a small building in downtown Edwardsville; they have a very small parking lot, but allow a few extra minutes to find parking if that is full. There were several interesting choices on the menu, with food items not commonly seen elsewhere. I had the Cornish pasty, which was very good: a tasty filling with a mild but distinct flavor, surrounded by a crispy crust. The House Side Salad was also good, with a mild balsamic vinegar dressing. 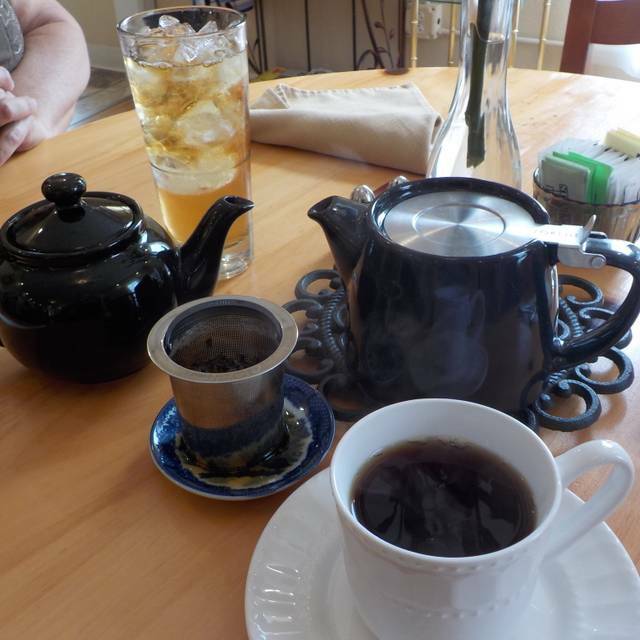 I had English Breakfast tea, which was steeped in a nice large-one-serving tea pot. My wife had the "Bit of Everything" (the contents of which can be found in the Queen's website's online menu), and found it to be quite good. She had a seasonal tea, which she also liked. Service was quite good on this not-too-busy day; we arrived for our 12:30 reservations, with few other diners present. A few other groups came in by 1 PM. An oddity, is ordering up at the counter, but having the food brought to the table when ready. I would have preferred full table service, but perhaps this setup is common in England. The decor was simple but tasteful, with British photos and items on display. Prices were moderate, in line with other "nice" lunch places. There is also an afternoon tea offered on certain days; we plan to try that at some time. Overall, we enjoyed Queen's Cuisine, and plan to return when we want a rather unique food experience. Everything we had was absolutely wonderful! I loved the autumn soup special, crustless quiche, scone with yummy clotted cream, and of course the tea! The service was friendly, too. I'll definitely be back! Brought my mom and daughters for Tea on Mothers Day and everyone thoroughly enjoyed it! Have also been for Tea at Christmas and had the same quality experience. She serves lunch as well, and serves the best scones you'll ever have! I highly recommend this place! The Queen's Cuisine was a lovely place to celebrate a friend's birthday. We had the "afternoon tea" which was a three-tiered tray of all kinds of freshly made delectable goodies. I can't wait to go back. Awesome experience! Loved the tea and all the treats! Will definitely come back for more! The food was amazing! We really enjoyed our first afternoon tea time. So cute and delicious food. This is a great find. 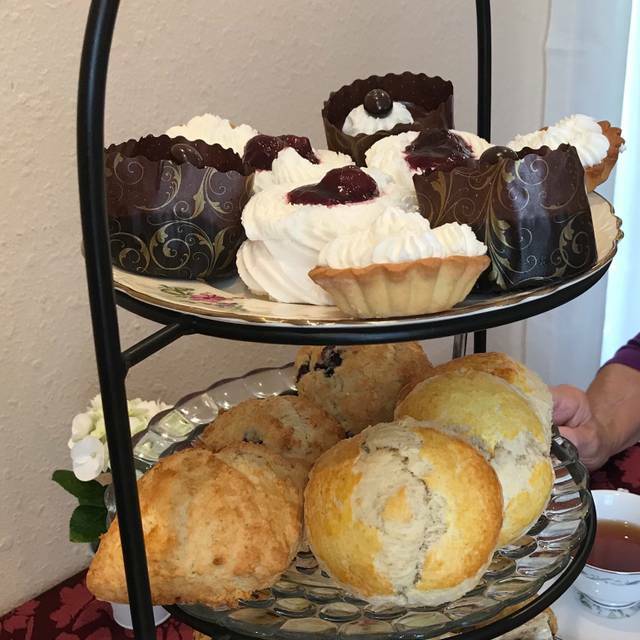 My daughter-in-law traveled to England and she said the high tea experience and scones could not be more authentic. The teas are marvelous. Can't wait to return. Disappointed that we had to order and pay at the counter, and even get our own ice! Also had to show ID for credit cards -- as if 3 65-yr old ladies are going to try not to pay!! You didn't make us feel very 'queenly'.